Date: (2) Days/evenings ($400) This course runs from late afternoon to early evening both days. Times will be stated in the welcome email packet depending on the time of year. Audience: Armed Professionals or civilians. This is predominately a Pistol course that also works in the use of an AR-15. This course for people who want to learn systematical search techniques for outdoor spaces and structures (home, workplace, etc.) to look for loved ones or criminals when time is of the essence. Also for those wanting to learn close quarters shooting (within 25 yards) skills with little or no light. Scope: This course is designed to teach students the fundamentals of low light operations, searching skills, and the principles to effectively/safely conduct these types of searches. This curriculum is designed for students that have a working knowledge of their firearms and some experience shooting them. 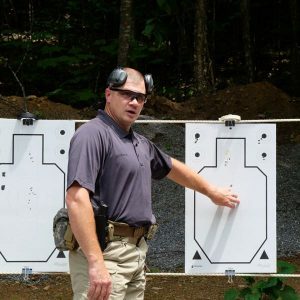 This course taught both for law enforcement and non-law enforcement personnel regardless of the number of times you have conducted low light operations. Classroom instruction, practical exercises (force on force) and practical exercises on the range will provide the student with a solid understanding and utilization of lights and low light operations. During the course, all participants will learn the terms, techniques, and procedures to make them successful. Training days are mid afternoon to early to mid evening depending on time of year. There will be 30 minutes for a dinner. For this reason it is highly recommended that you bring your dinner as you will have no options within 15 mins of the range. It is also recommended you have snacks, some will be available such as power bars, crackers and granola bars. Otherwise, please bring your own.